7:30am - Baby Boid is very conservative in his habits. He tends to do the same things over and over. And once he begins doing something, he continues doing that thing forever. 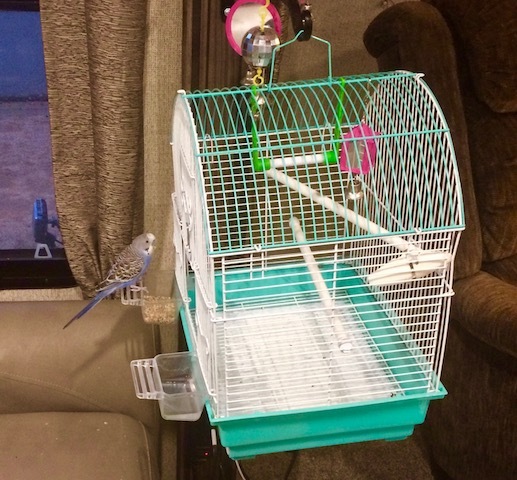 Recently, Boid began staying inside his cage, never leaving. Boid's cage door is left open. He is free to fly around Twayler's living room/kitchen. We became concerned! This habit is not a good habit for him to have. He seemed kinda depressed because he just sat there, all day long. A good tool to use for training is bird seed. Boid got to be unafraid of hands by holding his seed dish in my hand. Quickly, Boid figured out that it was OK to eat his seeds near my hands. From there, came my being able to reach inside Boid's cage and pet him. We wanted to encourage Boid to exit his cage. He should be happier and more happy when he flies around. Getting exercise. Looking out the window at the goings-on outside. We moved his seed and water dishes outside his cage! Baby Boid - Outside his cage again! Yesterday, here in my blog I came out politically. Why did I do that? I knew from the get-go, that Blogging about politics would not be taken well by some Readers. Blogging as I did yesterday, was an emotional reaction of mine to what has been going on badly here in our country. And going on for many, many years. I was kinda ashamed of myself for not doing one-single-thing about all of that bad stuff! Now is the time for all citizens, like myself, to stand up and be counted. To express themselves politically. To debate with other citizens what the course of our country should be. That is what I have done by coming out politically in my blog. I do not intend to do a lot of this political stuff here in my RV adventure blog. But I will do enough to present myself as a thinking and concerned citizen. I hope that you as a reader will do the same. Engage by making comments. It's a beginning. Note: When President Trump moves the United States embassy from Tel Aviv to Jerusalem tomorrow, that one thing will change everything! From that point, our entire world will change direction and move toward a better tomorrow. Not just for Jews and Israel. But for every single person on our planet. The design for Little Honda's new storage has just been completed! And that design is a great surprise! The current WalMart plastic cabinets, occupy about 75% of the 48" x 48" space of Little Honda's storage area [1,728 square inches]. The new cabinets, which we will construct ourselves out of plywood, will occupy a 12" x 36" space. Only 432 square inches! Man-O-Man! That is fantastically fabulous! No Reader has made a comment yet. So, I will make one! Coming out politically at this moment in time, here in my Blog, is one of the best things that I've done in my entire life! I am sooooo damned proud of myself! I had the guts to do it. And I did it! I am also proud of you Tioga George. It takes a lot of tenacity and courage to express your opinion publicly. Your thoughts and feeling about the state of this world matter and deserve to be expressed and shared with others. I am sooooo happy to read about how you feel! Now that I got my courage in place, what can stop me now? Thank you sooooo much for your many years of support! I LOVE Boid! I don't think he has a political preference. He just loves and trusts his caregiver. Dee, you are sooooo right in your comment! Boid is getting to getting to be my close pal lately. He is such a cool and friendly guy! I was just catching up on your adventures and I notice you stay at 24 hr fitness. I look on Google Maps to see where the 24 hr fitness places are, how many, where located, what states. I noticed that there is a company called "Anytime Fitness" that has way more fitness places all over the country. It's 24 hr also. So there you go. You might check it out for more "boondocking" and exercising spots!!!! Correction: I do not Nite Camp "regularly" in random 24 Hour Fitness parking lots. I did recently give this a try. However, my experiences have taught me that other Nite Camp sites are better. And especially more discrete as well. I am happy to see that you have expressed your opinions George! We were friends before and will remain friends after even though we will never come to agreement on Trump or the middle east problems. The good thing is, we are both so set in our opinions, it is pointless to argue so we will find other things to discuss. "....we will never come to agreement on Trump or the middle east problems...."
It is NOT pointless to discuss our opinions. In fact, it is essential to do exactly that. In order for you and I to go in the right direction, we must get together, perhaps in a forum the same as this one where we are right now. Share ideas. Debate. Argue. Take sides. Do whatever is necessary. To preserve, protect and defend the United States from the many enemies who work endlessly to take us down. I am happy you are pleased with your self in presenting your views on any subject including politics and your newest launch into world affairs. I understand your unbridled support of Israel but I don't understand the value of moving the American Embassy to Jerusalem where there are no longer any Embassies. It will act as a stick in the eye to Israel's enemies and they will find ways to fight back and when countries fight people die. Why should the US take and action that will create a bad situation where people will die? What is to be gained that makes the resulting reactions worth it? I have done a lot of reading and generally only people that want to start a fight/war support this. Those looking for less violent solutions do not. My Jewish friends and son-in-law who is Jewish think it would be a bad move. I became very excited to reply to your comment. It's an opening to a subject that I'm very qualified to address. That's because I've been involved with Israel since I was a little boy of six years age. Running around my neighborhood of City Terrace [East Los Angeles] with my little blue can from Keren Kayemet Israel [Jewish National Fund]. Saying to every person that i met, "Please? A few cents for Israel? It will buy a tree with your name on it in Eretz Yisroel [The Land of Israel]." "I don't understand the value of moving the American Embassy to Jerusalem...."
What you are wondering about is, I believe, at the very heart of President Trump's plan to change the direction that our world has followed for many years. And what is this direction? The United Nations began being against Israel in the 1970s. That's when UN membership increased from 82 to 126 member states. Those new members became the principal instrument for advancing Arab claims and actions against Israel, including even legitimating Palestinian terrorism. It is best that you read about how that came about on another website. Otherwise my reply to your comment might grow into a bible in size. Click [here] to read that website. ".....only people that want to start a fight/war support.....the US tak[ing] an action that will create a bad situation where people will die..."
This is the position that those who hate Jews and Israel want you to believe. But this position is actually propaganda. A lie that has changed the entire direction of worldwide politics and altered the course of history! I have a hunch. A belief. Maybe only a prayer? That Donald Trump understands all of this extremely well. And if I am correct, our destiny is about to get back on track and begin to move again, in the direction that it was supposed to be going all along. May G-d bless Donald Trump and all the right thinking people in our world. We don't always agree George but on the issue of the UN and Israel we are in complete agreement. The UN has done everything in it's power to minimize Israel and our last president helped them. I think Trump will go the other way. Love your story about the trees. Sorry but Trump doesn't have a clue. He is a manipulator and real estate broker but not an expert on foreign policy. The middle east is a tindebox and Israel is surrounded by enemies. The US is the most important friend of Israel. Without us Israel is destroyed. Playing with fire in this tinderbox makes no sense. You have provided information on Israel's right to exist and the struggles with the world community but nothing about why in the short term we should do provocative things to draw the enemies of Israel into a fight. In a recent poll the citizens of Israel are not in favor of the US taking this action. You have provided some interesting comments but nothing on my question of what is gained by us being provokative. I am not sure where you have gotten the view that Trump understands the middle east. Most experts say he has no clue and should move slowly and carefully as it is a tinderbox. You and I can only watch. How are you able to predict what the future holds? Where did I write that Donald Trump understands the Middle East? I am hoping that he does. PS: When Trump moves the US Embassy to Jerusalem, that will be a clear sign about his understanding of World politics [In my opinion]. George, you put too much faith in Trump. Trump's speeches remind me too much of Adolf Hitler's speeches and look what happened there. People shouldn't put too much faith in leaders with grandiose ideas i.e. building a wall. That is hog wash. Yes the US had lost all of it's dreamers -- then came Trump with a dream to Make America Great Again. That in itself is refreshing. The hope comes from the new possibilities (promises) that are yet to be implemented by the Trump administration being that inauguration was only yesterday. The previous few administrations were sucking the life out of the country with no hope of change. Yes, time will tell where Trump will take this country but at least there is a chance of life where there was only hopelessness. President (God, that sounds so good) Trump may be a real estate broker but at least he's a successful one, as opposed to a "community organizer"...what the hell kind of job is that that would qualify you to handle the problems facing our country? Sounds like a job that hosts a bunch of school age kids after class and before their folks get home. With the way the protesters are acting maybe that's it. George may be putting too much faith in President Trump, Rita, but you may be putting to little. Just how many Hitler speeches have you actually listened to yourself...not just taken the word of CNN, etc. I, and many others, have hope for this country...we pray that President Trump is able to turn this Nation around and again earn the USA the respect She had at one time. In the end, he's just a man, human like the next person. We've given Presidents Clinton, Bush, and Obama their day in the sun with mixed results. It's time to give this President his turn. Let it go. It's a done deal. Time to move on. Let's agree to disagree. No hard feelings. It's time to get back to enjoying the life and times of Tioga George and his latest antics. I am going to see what Donald Trump does, before I cast a judgement. I am not a polarized person. Do not run with the crowd. And believe all persons would be well served if they did the same. "The Silent Majority has spoken!" Good for you George. We will see what Trump will do before we praise him for things that hadn't happen yet. He made lots of promises but look how many promises were broken before....lets see if Trump fulfills most of the promises. It would be idiotic to think all promises will be fulfilled.